Below are links to some of my favorite sites. Richard Jones' Haunted-Britain.com Haunted Britain offers you the opportunity to explore and visit the many places where ghosts have been seen. The Haunted Britain site is maintained by best selling author and leading authority on the UK's ghostly lore Richard Jones. Haunted Britain is intended to be the most comprehensive listing of British and Irish ghosts on the Internet. Richard Jones' Haunted London Haunted London is brought to you by ghost book author Richard Jones. It is the culmination of a 27 year odyssey that has involved him collecting and investigating the true ghost stories and legends of the buildings, streets, pubs and graveyards of Haunted London. London Ghost Tour Dare you explore the shadows with London's premier ghost walk guide? The Ghost Hunt of York If you are ever going to be near York England one evening, The Ghost Hunt of York is a must see. Let Andy guide you through the city as he recalls stories of haunted York. Both fun and informative, this will be an evening you'll never forget. I have been on the Ghost Hunt about 15 times myself. Rick Steves' Europe Through the Back Door All the information and resources you will need when traveling through Europe. Everything from guided tours to rail passes. I use Rick's travel guides all the time on my castle journeys. Perle am Rhein The Perle am Rhein is a nice hotel and restaurant centrally located on the middle Rhein in Bad Salzig Germany between St. Goar and Boppard. It’s a comfortable hotel with views over the river as well as Burg Sterrenberg and Burg Liebenstein on the opposite side of the Rhein and the food is amazing. Markus and Susanne make you feel right at home. Piers for Rhein Cruises and the train station are situated minutes from the hotel making travel along the Rhein easy. 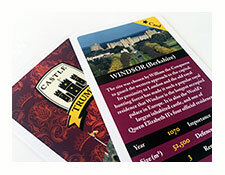 Clever Decks - Castle Trumps Castle Trumps, by Clever Decks, is the educational "Top Trumps"-style card game that makes it fun and easy to learn about British castles and history. The game was made in collaboration with 32 of the greatest British medieval castles, between which, players ‘battle’ to learn their incredible Histories, Age, Importance, Size, Defenses, Sieges and Remains. A great gift for anyone interested in castles and history, and to help introduce others- especially children- into the enjoyment of our national monuments and heritage, and to help with school and general education! The World of Castles Offering an extensive collection of castles and fortresses from all around the world: from world famous castles to hidden castles; from grand castles that intend to impress and dominate their landscape to small fortresses constructed primarily of wood and stone. Burgendeutschland.com Schlosser & Burgen in Deutschland (German Castles and Palaces) A great site about castles in Germany with special focus on pictures and lots of them. CastleXplorer Great Britain is full of castles and fortifications to explore. Some are large, famous and easy to find, while others are almost forgotten ruins. We love visiting castles and we've made this website to provide information about the castles that we have visited. There are currently over 180 castles featured on this site. Castles of Britain All things about British Castles can be found on this site. Tons of information avaliable from a castle expert. They are dedicated to the promotion and study of British Castles. Their goals are educating and stimulating people to explore the castles for themselves. Exploring Castles Join Edd Morris in exploring breathtaking castles from all over the world. His excitement for castles is contagious and the site is packed full of useful information and lots of helpful and interesting tidbits. Exploring Castles with Lise E. Hull For the past 20 years, Lise has progressed from a casual tourist to a castellologist and published author specializing in castle studies and British heritage. Guide to Castles of Europe Visit some of Europe's most picturesque, mysterious and notorious castles. Unravel the history, legends, and myths behind some of their most celebrated and not so renowned castles in a Voyage of Discovery and Adventure. Hidden England Historic Homes, Castles and British History. Set in tranquil parklands and ornate English gardens, each of the five historic homes of Hidden England is unique and together they offer a thousand years of living English history and English heritage. I love Castles If you have ever dreamed of living in a real castle and having castle dwellers for neighbors then this is the place to make all those fantasies come true! Medieval Castles and the Dark Ages This site features everything about medieval castles and a general insight into the Dark Ages and Medieval Times. You will find what made castles so effective in the past; what makes them magnificent in the present and what will make them unique in the future. Paul's Castle A website dedicated to the local history of the Medway area of Kent England featuring photographs of Rochester Castle and cathedral, Dover castle and other sites of historical interest in the south east of England. TopCastles.com More than 10.000 castles can be visited worldwide. If you love to visit, photograph and study castles like me you have to make a selection, you can't visit them all. Topcastles.com can help you make that selection. It has gathered the most beautiful and interesting castles and put them in a top 100 list. Haunted Castles & Hotels The UK's premier haunted hotel directory. Haunted accommodation listed throughout the UK & Ireland. Haunted Hotels in America The sister site to Haunted Castles & Hotels, featuring haunted accommodations in the United States. Hotels in London Online reservations of London accommodations: Hotels, Apartments, Residences, Townhouses, Bed & Breakfasts. Extensive information on each listed property, including 30-40 fast loading images, and direct contact with owners. Hotels in the United Kingdom Featuring over 17,000 hotels in the United Kingdom, whose room prices can be compared on over 50 hotel booking sites. Providing an overview of each hotel rating on different review portals such as Holidaycheck, Tripadvisor and Booking.com and also external reviews from offline travel guides. Get a completely free and independent overview of all the relevant information needed to complete a booking. Kilronan Castle Hotel, Ireland Our commitment is to provide the highest level of comfort and service. You will enjoy old world elegance with modern day comforts. One step inside Kilronan Castle and you are at home. With our warm and friendly atmosphere we will see to your every need, everything has been designed with your desires in mind. Lough Rynn Castle Hotel, Ireland One of Irelands most luxurious Castle Hotels, the ancestral home of the Clements family and the legendary Lord Leitrim, it is one of few Irish estates that can trace its history back to royal families. This secluded Castle is majestically set on the shore of Lough Rynn, surrounded by over three hundred acres of breathtaking scenery, lush green pastures, ancient forests and historical points of interest. Manor Castles Dream stays in luxury Historic Properties. Explore our hand picked collection of some of the world's finest luxury castle hotels, manor houses & châteaux. Nights In The Past Historic places to stay in the UK and Europe. If you’re looking for somewhere for a romantic break, business travel, weekend away, family holiday, history tour or honeymoon, we hope we can help you find what you’re seeking. During my travels to castles I have noticed that some of the castle gift shops are selling paper versions of the castles which enables the visitor to cut out and glue together replicas of the castle. Below are two of the companies that make the actual paper castle cutouts that you will find in the gift shops of most of the larger castles in Europe now. I myself have about 8 of these castle cutouts but have only started and finished the one for Pfalzgrafenstein and Burg Lichtenstein so far. These paper cutouts are designed to scale and have great details. There are no instructions and what little writing there is on the cutouts is in German. But the web site has free downloads to practice with and instructions on how to do their models in English. They are challenging to do, but lots of fun. These paper cutouts are also well detailed and feature French castles and landmarks. I have yet to try any of these, but they look great and I'm sure I'll order some soon, especially for Chambord and Chenonceau. Build Model Castles A great site which provides plans for building your own castles. Castlecolors.com Our site is a gallery of paintings and drawings of castles. We have many new featured artists and historic etching reproductions of over 500 castles.